Romance the classic symbol of love Taj Mahal. A mausoleum built by Emperor Shah Jahan in memory of love of his life – Empress Mumtaz Mahal. The true love of Emperor is depicted in gorgeous and eternal structure of this palace, you will sense the same while roaming on its pious white marble floor. Trip to Taj Mahal in most effortless way with such an ease. 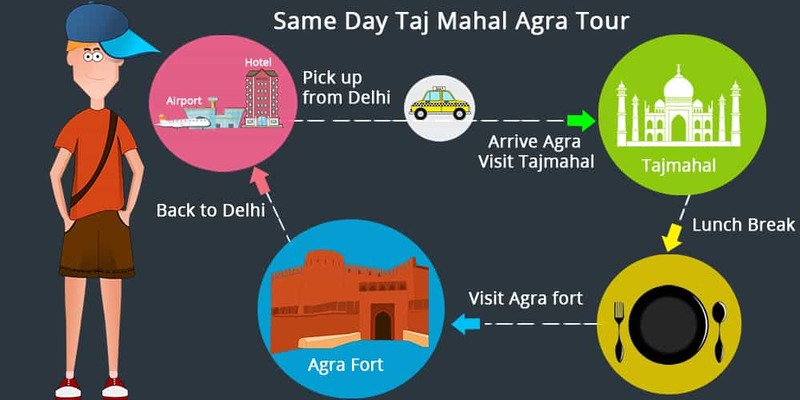 1.Get ready for pick up from Delhi airport OR your hotel for your further comfortable road trip to Agra. This journey takes approximately 4 hours, so an early morning start is recommended. 2.On your arrival at Agra, meet our expert guide who will accompany you during your Agra tour sightseeing. 3.Visit the wonderful mausoleum of Taj Mahal, built with utmost talent and care of 20,000 skillful laborers in a long time span of around 22 years to deliver this wonder of world. 4.Have a delicious break for lunch to pamper your appetite with tempting Mughal cuisine. 5.Get your turn to explore majestic Agra fort- the Red fort of Agra, built with red elegant sandstone by Mughal Emperor Akbar embellished with beautiful palaces, mosque and gardens. 6.Take a drive back from Agra either to your Delhi hotel or to Delhi airport with everlasting Taj Mahal memories. Our Same Day Taj Mahal Tour score an average of 4.8 out of 5 based on 344 reviews in the last year. From pick up to drop off, we loved every minute of our drive to Agra with Leisure India Holidays. Our driver was amazing! He was professional and friendly. It was a truly magical trip!. Leisure India Holidays did a great job on my day trip to the Taj Mahal. The Driver was helpful and accommodating and the Tour guide was informative. Taj Mahal trip was amazing with some great camera shots. Transportation in an exclusive air-conditioned Deluxe Car. Buffet Lunch will be provided at Specialty Restaurant. Services of an English Speaking or your preferred language Guide during your sightseeing in Agra. All expenses related to the vehicle i.e Fuel, toll-taxes, driver’s allowances, car parking and permit charges etc.